It is important to highlight that these are only those cases that have been reported, and where the victims are recognised as transgender. Join us and bring a candle along! Let us commemorate together the transgender victims of last year, and let us draw attention to the frequency and invisibility of hate crimes committed against transgender people. Speeches will be given by Csilla Csalos, Dániel Ábrahám Gyarmati and Tóbiás Benjámin Tuza. The poem ‘Úton’ (On the Road) written by Flóra Lukács will be recited. At the end of the remembrance we will light our candles together. You won’t miss it even if you are busy. The speeches will be streamed live on Facebook. 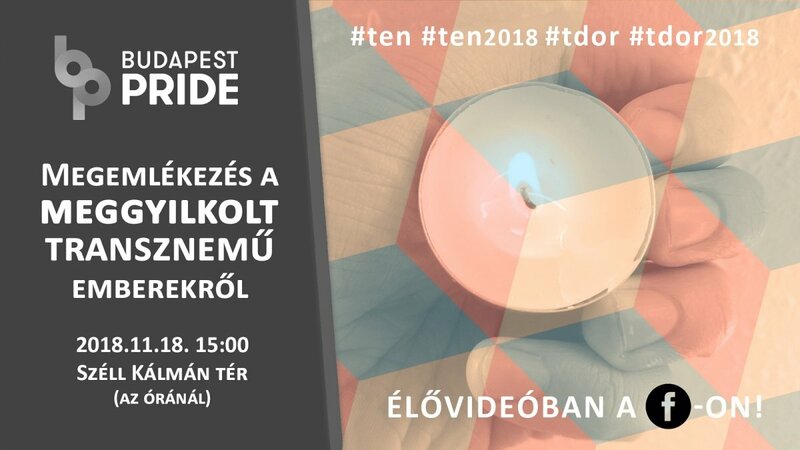 By coming to this event, the participants of the remembrance accept and agree that photos and/or video recordings may be taken of them during the event, and that those may be used on the online/offline communication platforms of Budapest Pride. The organiser and coordinator of the event is Ádám Valentin Csikós on behalf of the Rainbow Mission Foundation.